Mindika Moments: Monday Moments - Winner! and a fun announcement! Monday Moments - Winner! and a fun announcement! I hope everyone had a wonderful Thanksgiving. I enjoyed a fun filled day with 100+ of my Nordfelt family! It was a great day! And a great relaxing weekend. 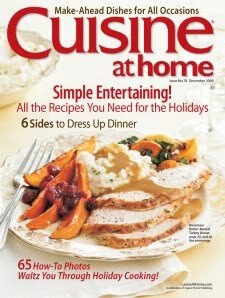 ...the winner of the Cuisine At Home Magazine 1 year subscription is.. I would love this magazine- my sister gets it, and it ALWAYS has great recipes! I facebooked about it, but I don't do the tweet thing yet... anyway- thanks for sharing your great recipes and such! I don't have an email address for you Wendy, so I need to hear from you as soon as possible. In order to start receiving your first issue by January 1, please email me at mindirandika@gmail.com by Wednesday, December 2nd. On to other news...I will be appearing on Studio 5 again this week! Tuesday, December 1st, I will demonstrate how to make my Sweet Potato Enchilada's during the cooking segment. It should be a lot of fun. Some of you out there may be shaking your heads and say, "Really? Sweet potatoes in enchilada's??" Trust me, this is a good one. Be sure and watch. For those of you who live outside the Utah area, after the show I'll post the recipe on my blog as well as link to the Studio 5 site where you can watch a taped version of the segment. If you want to.